The last two recipes I posted were healthy, low-fat, and packed with veggies, perfect for the week after Thanksgiving. But now I think it's time to talk about something a bit more decadent, don't you? After all, the holidays are coming up (sooner than I'd like to admit), and it is time for menu planning! If you are looking for a holiday-worthy vegetarian main course, this lasagna is perfect - definitely worthy of serving to guests. I brought it to a lasagna bake-off party (what a great party theme, huh? ), and it was a hit. It is a nice change from a typical lasagna with tomato sauce, and the squash and hazelnuts make a great flavor and texture combination. And with a generous amount of cheese and creamy sauce, lasagna doesn't get much better than this! Melt butter in a deep, heavy 12-inch skillet over moderate heat. Add onion and cook until softened and golden, about 10 minutes. Add squash, garlic, salt, and white pepper and cook, stirring occasionally, for 15 minutes. Cover pan and cook until squash is tender, about 5-7 minutes longer. Remove filling mixture from heat and stir in parsley, sage, and nuts. Add additional salt to taste if necessary, then cool filling. Melt butter in a 3-quart heavy saucepan over moderately low heat. Add garlic and cook, stirring, for 1 minute. Whisk in flour and cook mixture, whisking, 3 minutes. Slowly pour in milk, whisking. Add bay leaf and bring sauce to a boil, whisking constantly, then reduce heat and simmer for 10 minutes, whisking occasionally. Stir in salt and white pepper and remove sauce from heat. Discard bay leaf. Preheat oven to 425 deg F and butter a 9 x 13-inch baking dish. Mix cheeses together. Spread 1/2 cup sauce in the baking dish and cover with 4 pasta sheets. Spread 2/3 cup sauce over the noodles, top with one third of the filling, then sprinkle with a heaping 1/2 cup cheese. Repeat this layering 2 more times, beginning with pasta sheets and ending with cheese. Top with the remaining 4 pasta sheets, remaining sauce, and remaining cheese. Tightly cover the baking dish with buttered foil and bake lasagna in the middle of the oven for 30 minutes. Remove foil and continue baking until lasagna is golden and bubbling, 10 to 15 minutes more. Let lasagna stand 15 to 20 minutes before serving. ooh, i've done a lasagna with butternut and goat cheese sauce, but i forgot the hazelnuts ;) delicious!! I love squash and nuts paired together. This looks like a delightful dish! I loooove butternut squash lasagna - especially because you didn't use ricotta (which I'll eat but am not crazy about). Perfect! 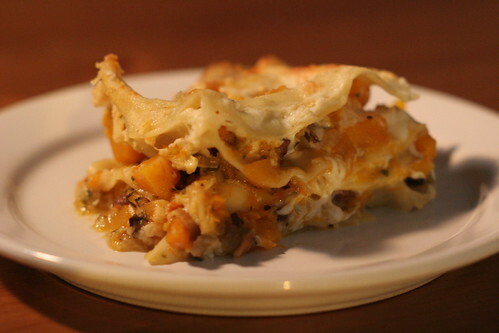 Butternut squash lasagna is definitely high on my list of vegetarian holiday entrees! This looks delicious. I love the hazelnut twist! I love nuts in warm dishes, you usually see them primarily in colder dishes and salads. This looks divine. I have a few indulgent butternut squash lasagna recipes saved but I especially love the addition of hazelnuts here. They are my favorite nut for sure!! I love butternut squash in pasta - never thought of adding hazelnuts too, it sounds delicious!